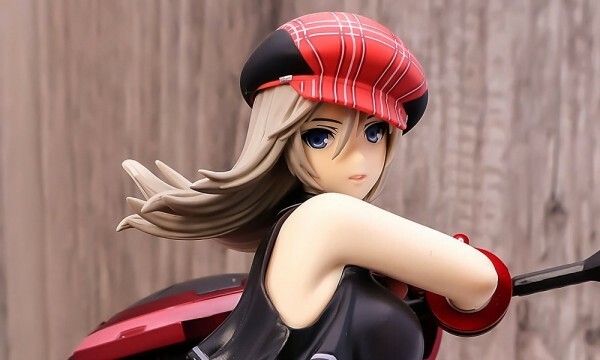 It’s time for another figure review! 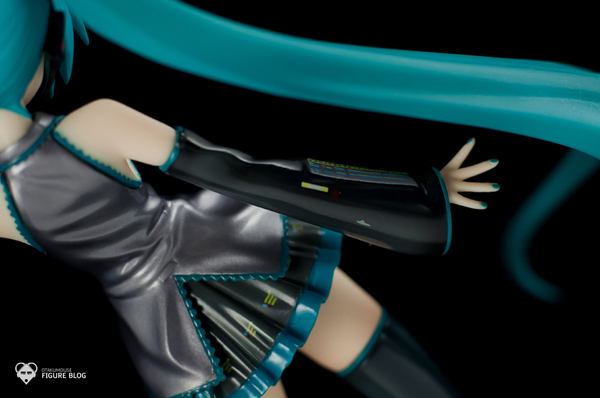 Today we will be taking a look at the re-release version of the original Hatsune Miku figure from Good Smile Company that was released 3 yrs ago. 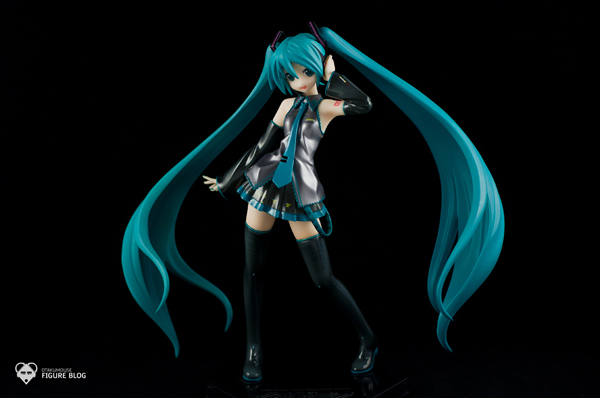 The figure was based on the original illustration of Miku’s original character designer, KEI. 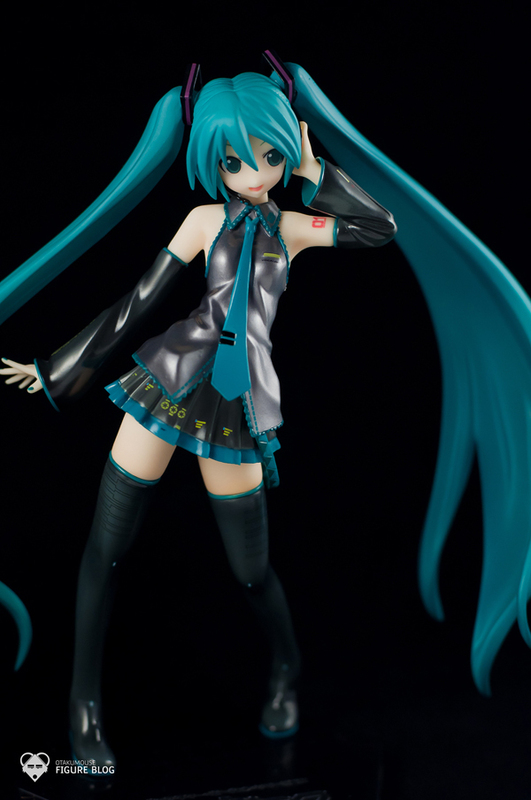 This figure (I think) was the first Miku figure by GSC. 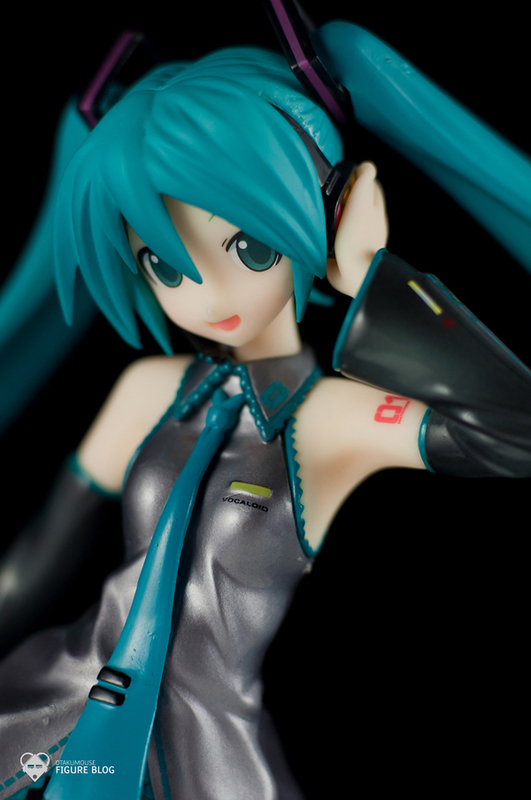 The Hatsune Miku fever was still just starting when this figure was released and I’m still not that familiar with the character so I decided to “pass” in purchasing this figure back in 2008. In 2009, Good Smile Company released an alternate version of this figure with the exact same looks dubbed “Commercial Version”. 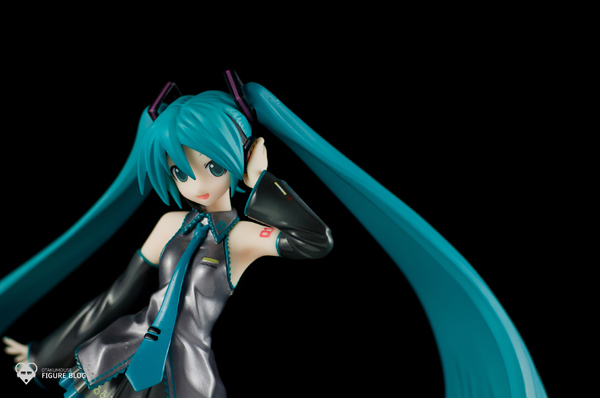 The only difference was Miku’s eyes were closed in that version. 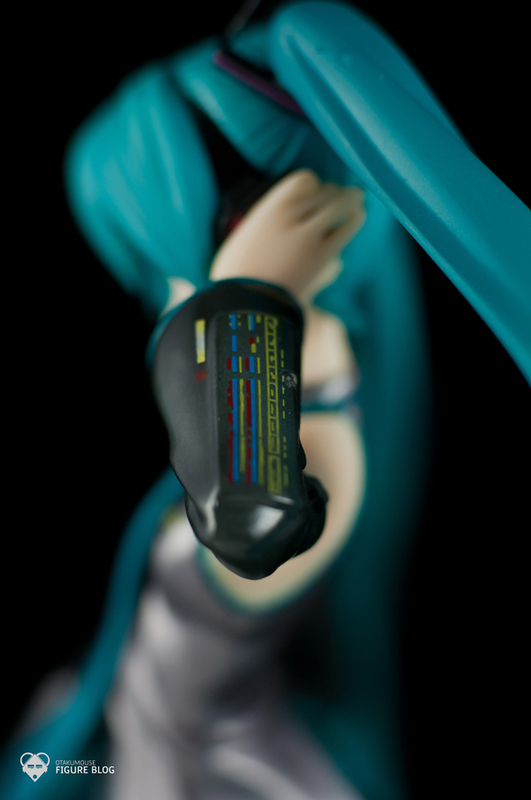 This figure was one of the very first “looks” of Hatsune Miku when she was introduced as the official mascot of the Vocaloid singing synthesizer. Miku’s popularity sky rocketed and now has an unbelievable number of followers. 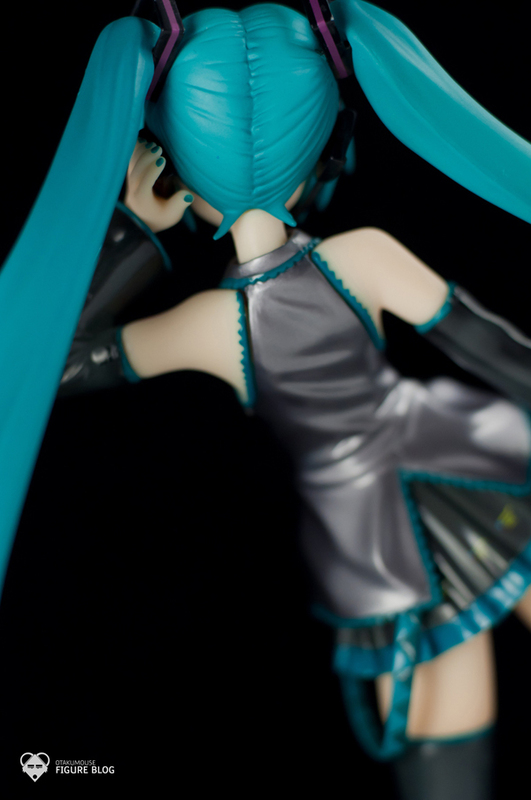 The figure was really sculpted well. 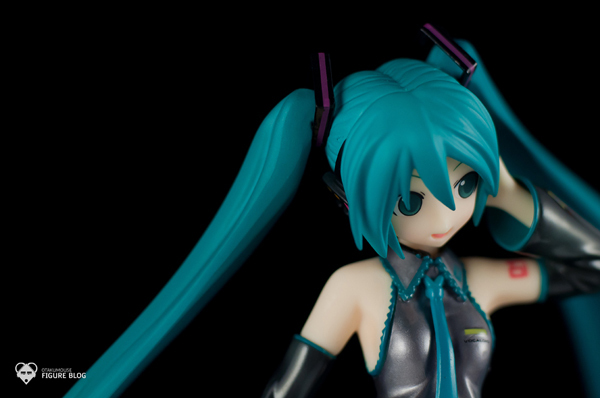 Every minor detail of Miku’s character is accurately portrayed in this figure. 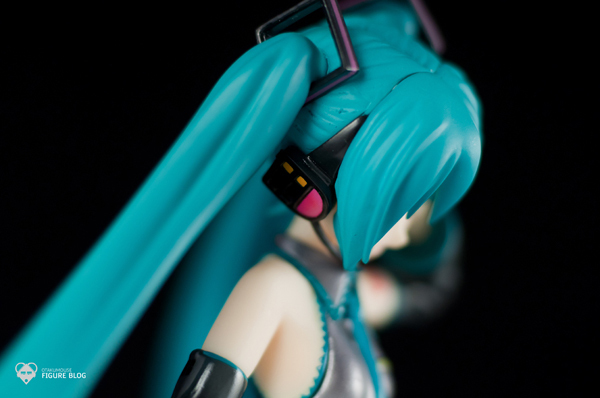 One of the most attracting parts of Miku’s character design was her free flowing twin tails. The figure’s paint job was also top notch. 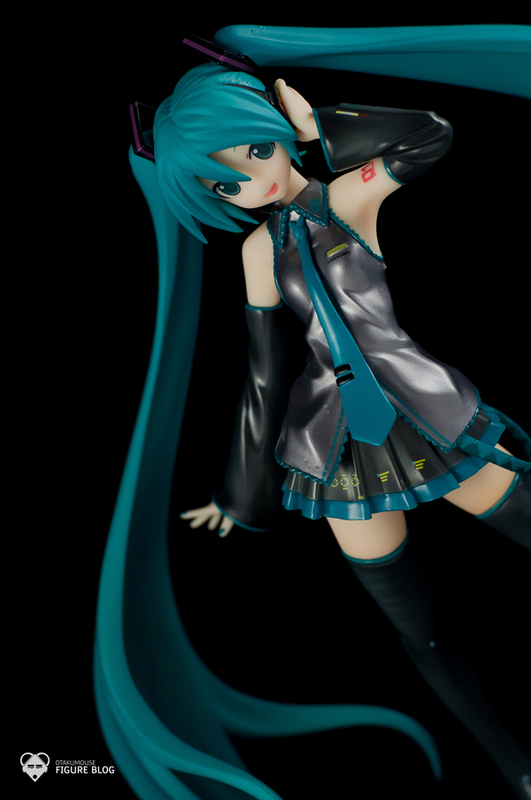 The glossy paint applied on Miku’s outfit really makes her stand out. 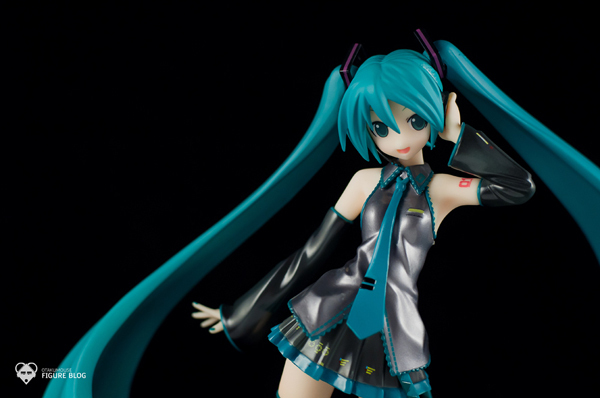 This figure is technically 3 yrs old but it’s still one of the best figure renditions of Miku out there. The “kawai” level of this figure is just outstanding. I’m sure this is one of Miku’s traits that helped her gain an unbelievably large fanbase. 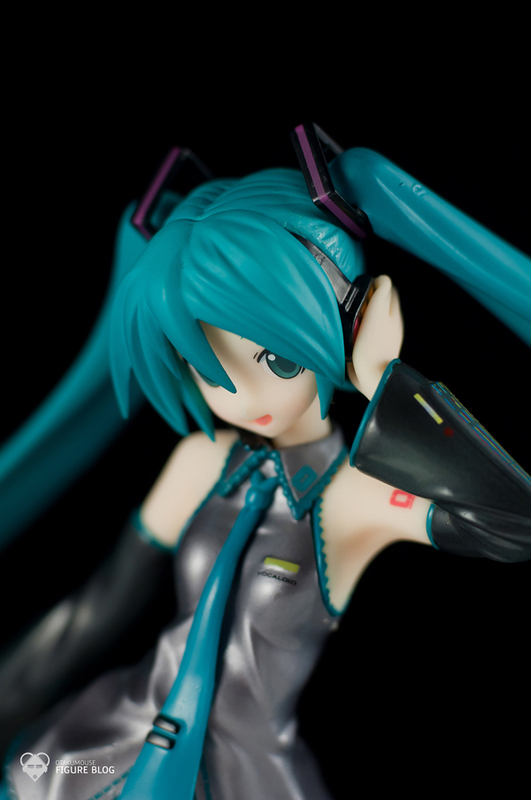 Miku started as the official mascot of the Vocaloid singing synthesizer. Due to her rising popularity, she now has a concert of her own, an album of her own, and was even chosen by Toyota as the official endorser of the new Toyota Corolla. 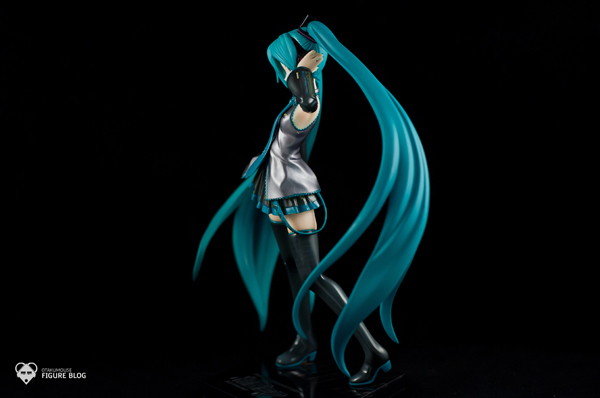 The pose of this figure is somewhat similar to the original illustration of Miku in the Vocaloid application box art with the exception of her left hand holding her headset. 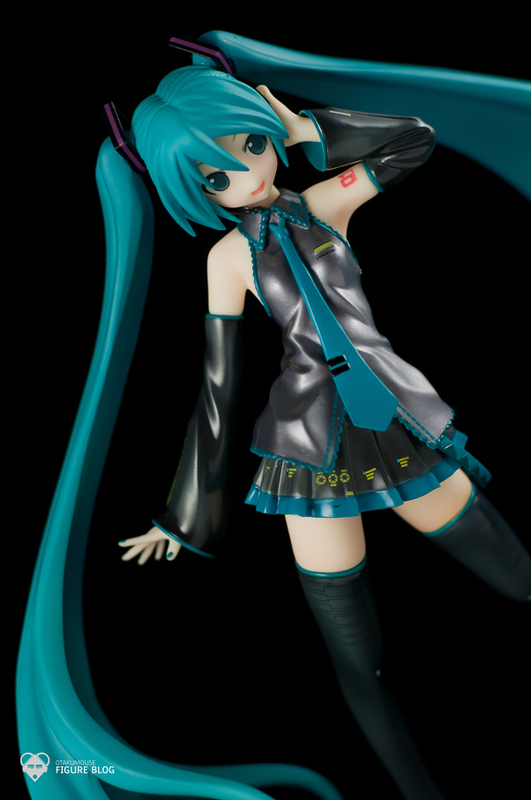 And yeah, Max Factory also did a figure rendition of Miku which is 100% based on the box art I mentioned earlier though I like GSC’s version more. 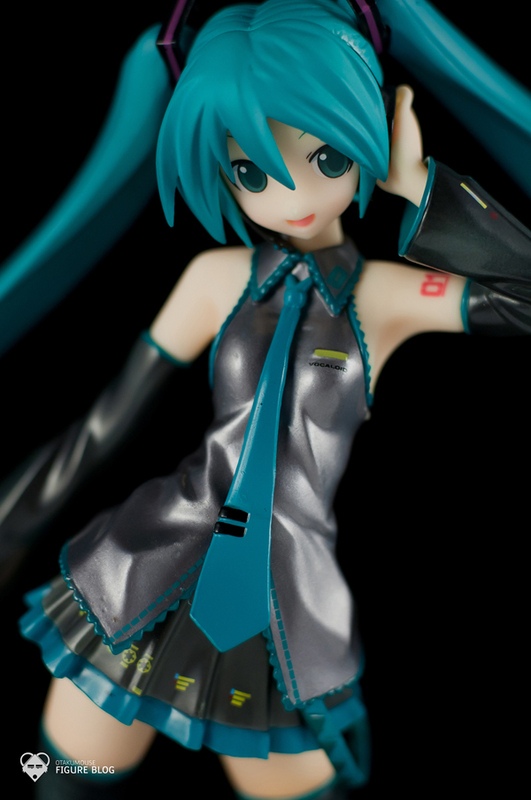 The color contrast of the figure is great. The tones on her hair and outfit makes the figure look natural and alive. I really like the pose of this figure. 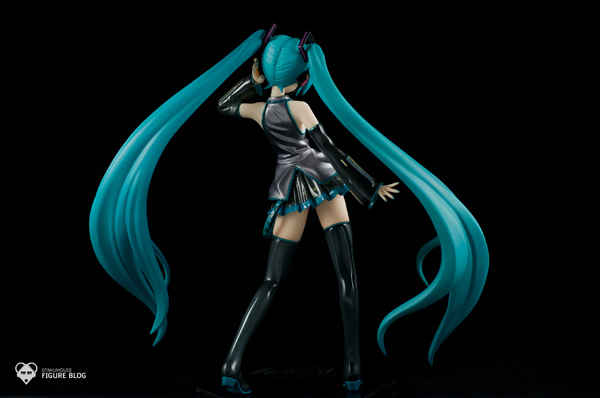 I kinda noticed that maybe, this is the signature pose of Miku because this pose is really evident on other figures as well, like the Lat version and Sega’s version. 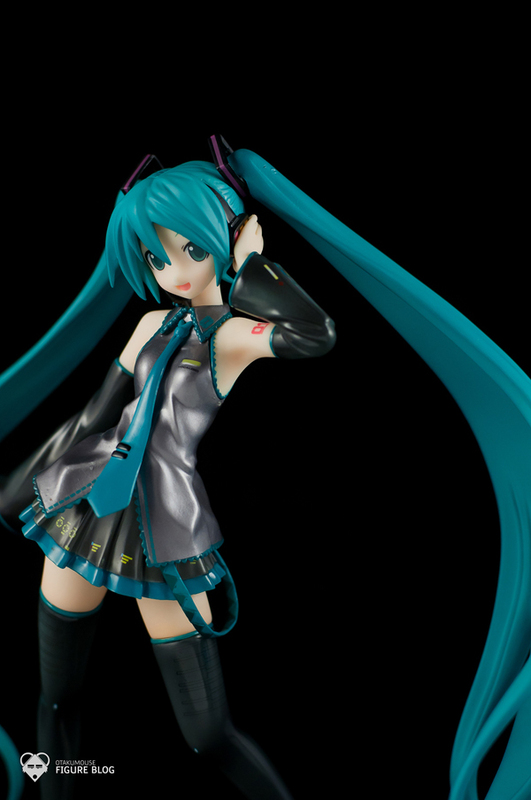 Still, it clearly shows Miku’s gracefulness as a character/singer. 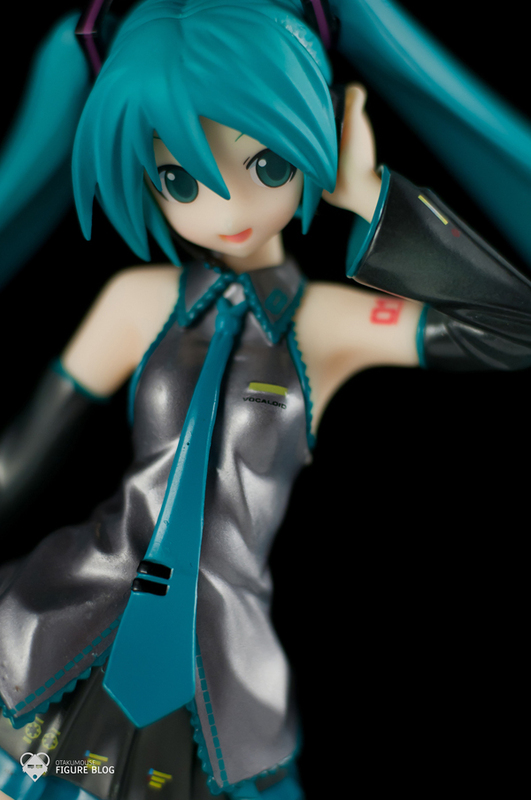 I experienced some technical issues on my lighting when shooting this figure because of the figure’s “whitish” face. 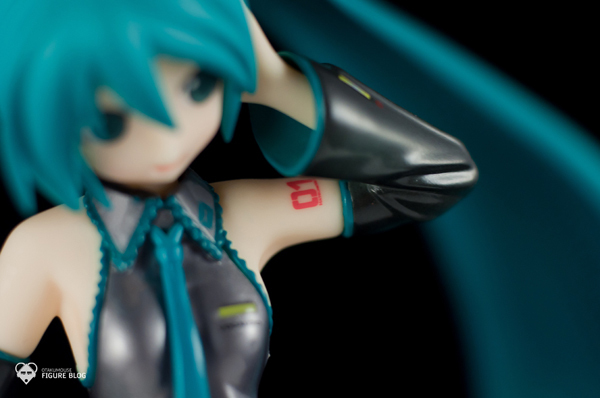 My early shots of her turned out to be properly exposed except for her face which is over exposed. Adjusted my lights a bit and added a few tweaks on my setup until I got the exposure that I want. Kinda difficult if you’re not a PRO photographer like me lols! Micro details like the decals on her outfit was pretty accurate and well made. This shots are impossible with my nifty fifty 1.4 lens. 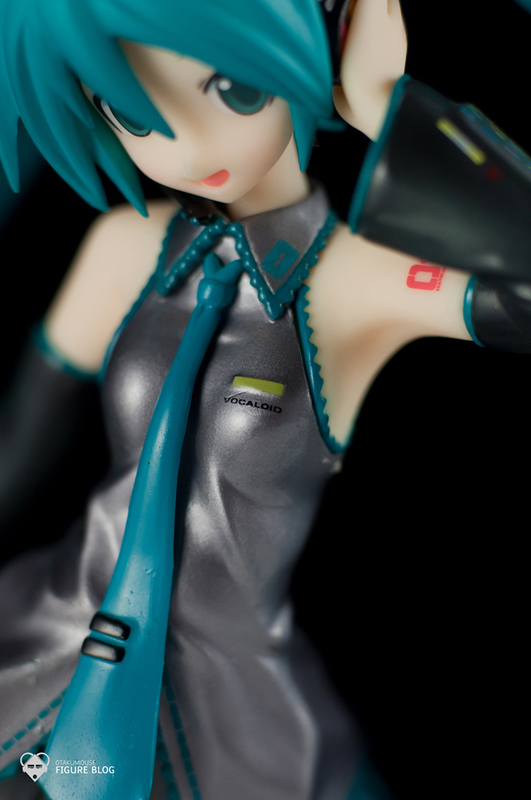 I used the 12mm extension tube so that I can get much closer to the subject and get as much detail as i want in the figure, like this clearly typed decal on her outfit. 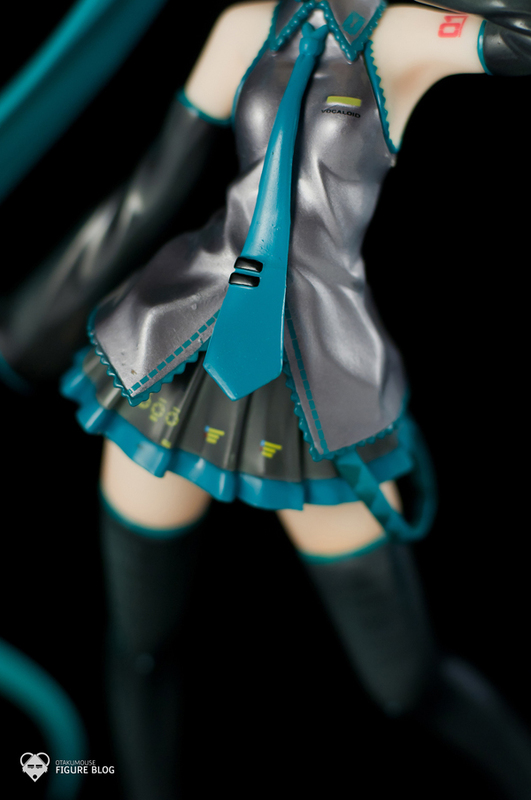 Some great detail on her skirt. I really enjoy figures with an insane amount of detail. 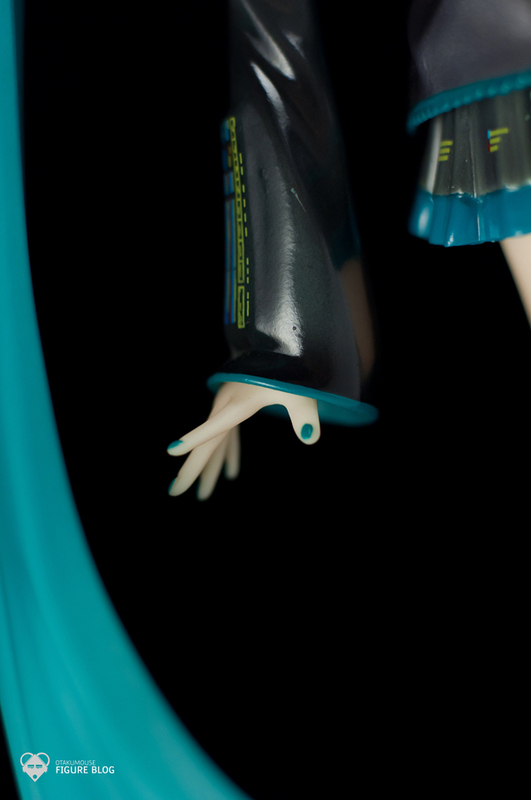 Not all figure manufacturers are like this and some of them actually skips painting the nails or doesn’t totally render the nails in their figures. 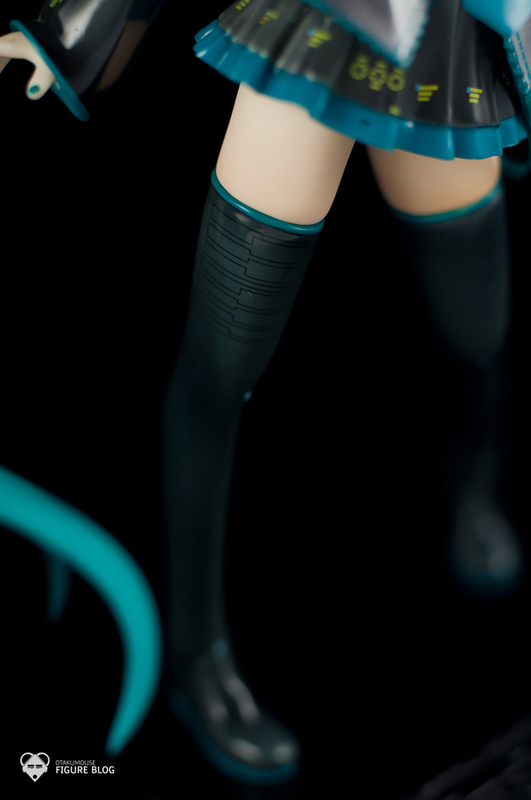 I just noticed a slight bumb on her left twin tail. Might be a factory defect. Not a big deal though. 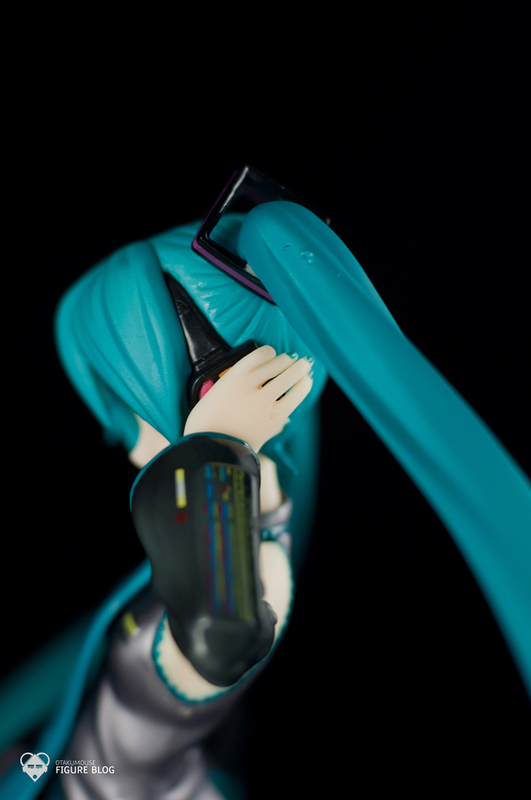 This is my 6th Hatsune figure in my entire collection and It feels great to have one of the earlier renditions of Hatsune Miku as a figure. 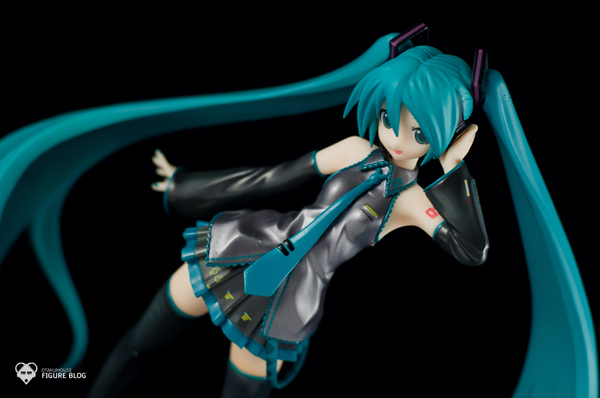 The figure is already 3 yrs old since it was released but don’t let this stop you from getting the figure. here are some final shots for you to enjoy. The figure is great in all aspects. The sculpt, paint job, and overall design is top notch GSC quality. 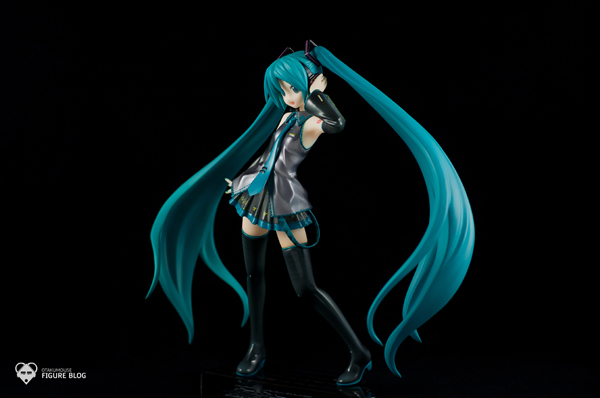 So if you are an extreme Hatsune Miku fan, and you haven’t had the chance to get this figure 3 yrs ago, now’s your chance to get it! They’re re-releasing it for a reason. It’s worth it. 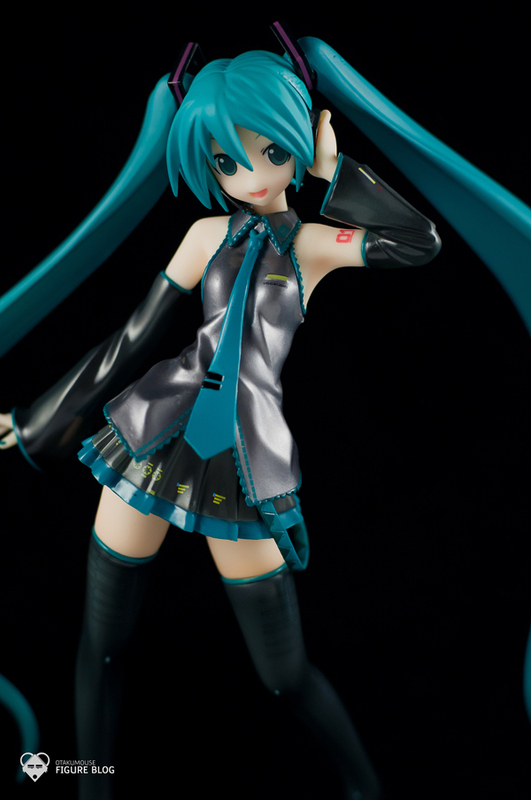 This figure is really nice, I like her petite body in combination with the massive twintails. The pose is a good mix of dinamic and cute.